Egon Wellesz was born into an affluent Jewish family and had every expectation of a brilliant musical career in his home city of Vienna. Like many another he had reckoned without the malign intervention of Hitler's Third Reich. He fled to England where he remained after the war and became a noted academic much respected at Oxford University and beyond. He also contributed to Grove. His symphonies achieved the occasional Third Programme broadcast and at one stage the conductor Hugo Rignold became something of a champion so far as the later symphonies were concerned. Do not miss Paul Conway’s Wellesz article on this subject. The first five symphonies proclaim their roots in the great Germanic symphonic tradition with links to Schubert, Bruckner and Mahler but all increasingly viewed through Schoenberg's 12-tone 'glass'. All of them may be seen as having been liberated by the experience of the Second World War; look at the date of the first of them. The present set is the only way to hear the Wellesz symphonies. That is unless you buy them piecemeal as single CPO discs. They were issued over a five year period; links to the MWI reviews of the solo discs are built into the header. What CPO have done, rather as they did with their Pepping, Yun, Siegfried Wagner, Frankel, Pettersson, Toch and Atterberg boxes, is to scoop the discs off the warehouse shelves, place them in a new cardboard slipcase, then apply the shrink-wrap machine and a much lower unit price. Very welcome too. Wellesz’s First Symphony, written when he was a Brahmsian sixty, is in three movements. The first of these has a slightly academic Bachian flavour – perhaps shades of a Stokowski organ transcription on a stern day. This is clearly a very serious piece of writing. The second movement is more carefree - a model in lucid and dancingly buzzing activity - sometimes it too slips into fugal patterning. The final molto adagio sostenuto has genuine emotional depth; more inward and passionate than the preceding movements. The writing of this work must have been a great release because throughout the war Wellesz had been unable to write a single note of music. The compact Eighth Symphony was premiered in a very different world in 1971 in Vienna by Miltiades Caridis. It is a work of emotional turbulence, protesting anger and drained exhaustion. It is expressed in the free-wheeling language of dissonance and angularity rather than of Schubertian melody. A much more compact work than the First it is about two-thirds the length of the earlier piece. The Symphonischer Epilog is in much the same dissenting and fragmented style. The tense discontinuity of these later works recalls late Havergal Brian as in his Symphonies 24 to 32. Wellesz like Brian had the genius to paint elusive moods; listen to the last few moments of the Epilogue - a work, rather like Brian's Symphonia Brevis, that repays repeat listening sessions. It was premiered on 13 May 1977 by the Lower Austrian Musicians' Orchestra conducted by Carl Melles. The Second Symphony is the longest of the nine; the Ninth is the shortest bar the seventh. Certainly Wellesz became less discursive over the quarter century spanned by his symphonies. The Second is most impressive – a work you must hear and fascinating at every turn. This is a work of consistently high standard. This much is proclaimed by its memorably hushed Brucknerian gallop, its tender romance and noble aspect [4:40, I] and to the benevolent insurgency and infiltration of tone-rows in the least intimidating way. Its Scherzo is engagingly Nutcracker-gawky in the manner of Siegfried Wagner and Franz Schmidt. The Adagio has a grand funereal tread. The finale recalls Schubert’s Great C major and ends by juxtaposing playfulness with eldritch awe. By contrast the Ninth Symphony is succinct and resolutely dissonant – even forbidding. Yet amid the fractured mosaic a range of moods is accommodated: from striding and scorched tragedy to lop-sided humour to hauntingly acidic arching grandeur. In the thorny company of the Sixth and Seventh Symphonies the Fourth, Sinfonia Austriaca declares its faith in romantic roots. With that title I was expecting something as discursive in scale and epic in mood as Furtwängler's Second, Karl Weigl's Fifth or Franz Schmidt's Second. In fact the latter is a close cousin with rustic charm meeting tortured massed violin writing and cresting French horns. The eloquent confidence of the string anthem at 3.03 in the Adagio impresses deeply. The work was premiered on 11 November 1956 in Vienna conducted by Rudolf Moralt who made a fine 1950s recording of the Schmidt Fourth Symphony. Six and Seven are cut from uncompromisingly dissonant and episodic cloth. 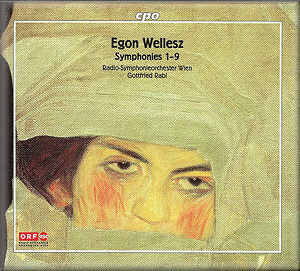 The level of challenge is similar to the symphonies of Frankel though Wellesz is more doom-laden and despairing. Havergal Brian is again another reference point. If this is organic progress its ineluctable arc is deeply subsumed. In the middle movement of the Sixth - the last five of Wellesz's nine symphonies are in three parts - he uses his hallmark method of touching in a theme by passing it note by note to different instruments. The themes themselves are not playful but speak of the distraught, the tragic. Moments of light occasionally float into sharp focus as in the rural caprice of 4.48 in the finale of the Sixth. These are dispelled by spasms and shudders of cold disrupting the winter sunshine. The Sixth ends in quiet repose while the Seventh shouts in tragedy – the brass rail in angry magnificence. Otherwise the moods of the two works have much in common. He is never dull or prolix and always displays brilliance in instrumental texture. All the same many will find this hard going. The symphonies 6 and 7 were respectively premiered on 23 June 1966 at Nüremberg with Michael Gielen/Bavarian Radio Symphony Orchestra and 21 November 1968 with Hugo Rignold/City of Birmingham Symphony Orchestra. The Symphony No. 3 was started one year after completion of the Second but was not premiered until 2002. The music has little in the way of surface attraction – again no easy victories. There is a Brahmsian sobriety about this and the first movement is like a Bach organ work transcribed by Schoenberg. The second is more ingratiating but rises to a Brucknerian gravity of expression. The scherzo third movement skips along almost nonchalantly with Brucknerian references peeping through and across the bar-lines ... and the sun is shining. A contented gift of a melody plays the feminine riposte to a daring masculine figure recalling the Bruckner symphonies 3 and 4. The finale has Protestant earnestness as if wanting to put behind it the ‘indecency’ of the two central movements. I must not overdo references to the Schoenberg voice but certainly the music betrays a freer approach to tonality. The work ends with a typically terse Brucknerian gesture. Four years later came the Fifth Symphony with a similar palette to that of the Third. Again the four movements are desperately serious with strong tribute presented to Schoenberg. They only lack the contrast of the central movements of the Third. Counterpoint and fugue thread their way through this work of North German gravity. It smiles but it can be a relentless grimace. Solo voices, woodwind and violin, float free but the language is always occluded and soaked in the 12-tone argot. Intriguingly the finale with its pummelling bass-heavy sound is topped off by shrieking trumpets; a contrast to all that has gone before. It ends with an emphatic angry growl. Rabl gives a masterfully intense performance. There is even a majesty of sorts but it is of an awe-struck forbidding sort among much that is trudging, turbulent and unforgiving. The conductor's notes about the recording process tells us that Wellesz's printed scores and mss were littered with errors. Time oppressed the elderly composer and a harvest of misprints and mistakes was the result. Fortunately Rabl was able to examine sketches and galley proofs at the National Library in Vienna and has made all the necessary corrections. The excellent background notes by Hannes Heher are in the usual encyclopedic CPO style. The recordings of these deeply serious and sometimes unsettling symphonies are uniformly superb – lively, three dimensional and natural.